"Remember that right is still right, even if nobody is doing it. Socrates was one of the first Greek philosophers to encourage both scholars and the common citizen to turn their attention from the outside world to the condition of man. 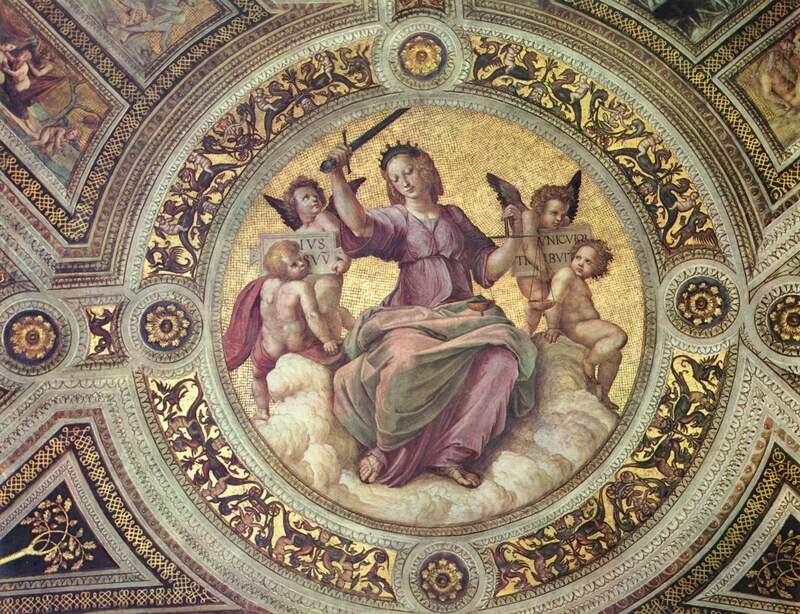 In this view, knowledge having a bearing on human life was placed highest, all other knowledge being secondary. Self-knowledge was considered necessary for success and inherently an essential good. A self-aware person will act completely within their capabilities to their pinnacle, while an ignorant person will flounder and encounter difficulty. To Socrates, a person must become aware of every fact (and its context) relevant to his existence, if he wishes to attain self-knowledge. He posited that people will naturally do what is good, if they know what is right. Evil or bad actions, are the result of ignorance. If a criminal were truly aware of the mental and spiritual consequences of his actions, he would neither commit nor even consider committing them. Any person who knows what is truly right will automatically do it, according to Socrates. While he correlated knowledge with virtue, he similarly equated virtue with happiness. The truly wise man will know what is right, do what is good and therefore be happy. Aristotle posited an ethical system that may be termed "self-realizationism". In Aristotle's view, when a person acts in accordance with his nature and realizes his full potential, he will do good and be content. At birth, a baby is not a person, but a potential person. In order to become a "real" person, the child's inherent potential must be realized. Unhappiness and frustration are caused by the unrealized potential of a person, leading to failed goals and a poor life. Aristotle said, "Nature does nothing in vain." Therefore, it is imperative for persons to act in accordance with their nature and develop their latent talents, in order to be content and complete. Happiness was held to be the ultimate goal. All other things, such as civic life or wealth, are merely means to the end. Self-realization, the awareness of one's nature and the development of one's talents, is the surest path to happiness. Aristotle asserted that man had three natures: vegetable (physical), animal (emotional) and rational (mental). Physical nature can be assuaged through exercise and care, emotional nature through indulgence of instinct and urges, and mental through human reason and developed potential. Rational development was considered the most important, as essential to philosophical self-awareness and as uniquely human. Moderation was encouraged, with the extremes seen as degraded and immoral. For example, courage is the moderate virtue between the extremes of cowardice and recklessness. Man should not simply live, but live well with conduct governed by moderate virtue. This is regarded as difficult, as virtue denotes doing the right thing, to the right person, at the right time, to the proper extent, in the correct fashion, for the right reason. However, Aristotle's method of observing the present state of things and drawing social conclusions from them, led him to propose a rigid hierarchy of human beings, in which Greek aristocrats were at the top, and women and slaves were akin to 'domestic animals'. According to Aristotle, virtue is defined as a balance point between a deficiency and an excess of a trait. The point of greatest virtue lies not in the exact middle, but at a golden mean sometimes closer to one extreme than the other. It requires common-sense smarts to find this golden mean. In Aristotle's sense, it is excellence at being human, a skill which helps a person survive, thrive, form meaningful relationships and find happiness. Ethics is the major branch of philosophy, encompassing right conduct and good life. It is significantly broader than the common conception of analyzing right and wrong. A central aspect of ethics is "the good life", the life worth living or life that is simply satisfying, which is held by many philosophers to be more important than moral conduct. Today, it seems imperative that the ﬁssures encouraged by collective identities be off-set with ethical standards of respectful engagement with others. What the global community seems to lack is an ethics of comity which would encourage mutual respect and collaboration. We live in a world which is complex and multitudinous in spirit and action but it does not need to be chaotic or confused. The practices of comity permit complexity without it becoming destructive and provide a spontaneous order in which differences can be symbiotic. 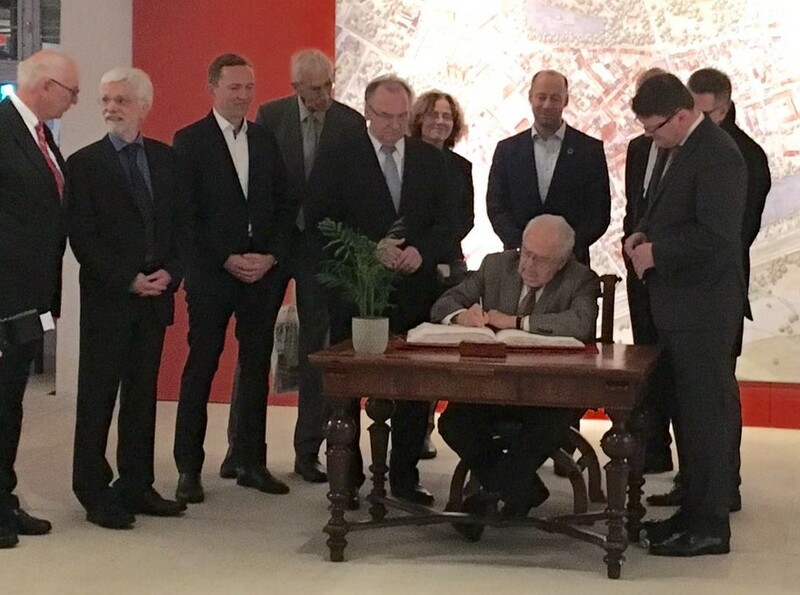 The Wittenberg Centre for Global Ethics works to resolve societal conflicts by applying an approach to ethics developed by several generations of academics. Core interest is in communicating ethical principles which individuals, corporations and other organisations can apply in everyday situations. In the following, the most important premises of our approach to ethics will be explicated. The informal understanding of the game (ideals, values and convictions), which determine the discussion regarding which freedoms can be enjoyed within the social order and how new conflicts which emerge can best be resolved. Both levels of social order are integral for maintaining freedom. Prevailing ideas about values, in combination with the applicable formal rules define the expectations which people develop, where there is potential for cooperation or conflict and the latter will be experiences and dealt with. This applies equally to international cooperative ventures, national communities and specific organisations. Both levels of social order are being put under pressure. As a result of the increasing pace of development and the respective disruptions and growing uncertainty, prevailing rule systems are losing their power. (Digital) innovations, short-term crises and ad-hoc developments lead to conflicts, which often cannot be resolved using traditional means of analysis, standards and processes. In addition, the diverse traditions and ideals are coming into competition with one another. As a result, initiating and conducting a dialogue about potential means of conflict resolution is becoming increasingly difficult. In 2007 NEXUS Institute enlarged her activities by organising masterclasses and a seminar. The seminar was held in October 2007 in the Venice International University University, situated on San Servolo, an island in the Venetian Lagoon. compassion concerning cancer and aids. Being a pianist and a conductor he excels in the most universal language: music. Barenboim displayed his talents as a pianist during numerous concert tours. Nowadays he is considered one of the greatest conductors of our time. His books and lectures show his unshakable faith in the humanistic message that irridiates from art in general, and music in particular. In his Nexus Lecture he continued his lifelong search for the meaning of music by trying to answer the question: what is the true imperative of beauty? The two dictators were not able to connect aesthetics with ethic. Music can bring together people, however, when conscience is quiet, also music is powerless. But for Barenboim there is no doubt that art without ethic cannot exist (fragments from Brabants daily paper by M. van Eck). SHOULD WE STRIVE TO CREATE THE PERFECT MAN? Sandel subscribes to the theory of communitarianism (although he is uncomfortable with the label), and in this vein he is perhaps best known for his critique of John Rawl's A Theory of Justice. Rawls' argument depends on the assumption of the veil of ignorance, which allows us to become "unencumbered selves." Sandel's view is that we are by nature encumbered to an extent that makes it impossible even in the hypothetical to have such a veil. Some examples of such ties are the ties we make with our families, which we do not make by conscious choice but are born with them already attached. Because they are not consciously applied, these ties are impossible to separate from someone. Sandel believes that only a less-restrictive, looser version of the veil of ignorance can be possible. Rawls's argument, however, depends on the fact that the veil is restrictive enough that we make decisions without knowing who will be affected by these decisions, which of course is impossible if we are already attached to people in the world. The concept of good and evil usually expresses a contrast or tension that is found in many religions, philosophies, myths and other stories. In science, the concepts of good and evil are viewed in different disciplines and from different angles: ethics (a branch of philosophy) studies the connection and the distinction between good and evil, psychology examines the behavior and reasons of people who choosing good or evil, within medical science, among other things, biological links are sought with these concepts and theology focuses on possible ways of dealing with them. There are different philosophies to make the distinction between good and evil, such as utilitarianism and consequentialism (*). 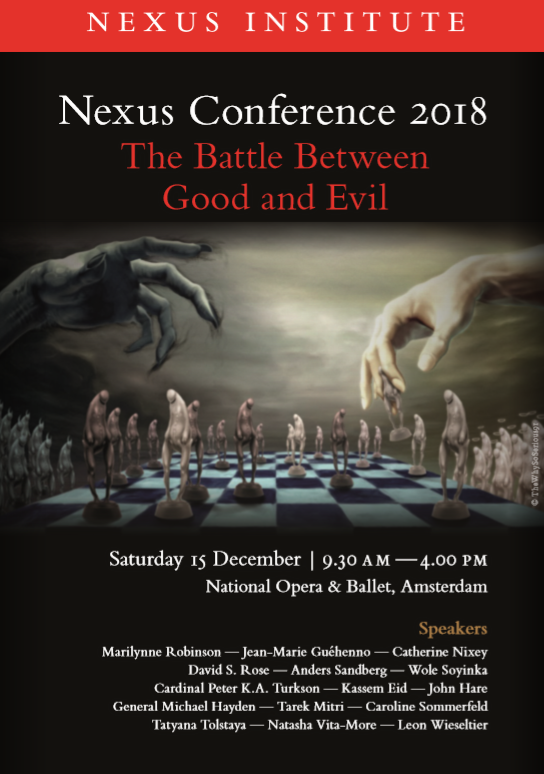 On 15 December 2018, the speakers at the Nexus Conference took up this battle in two roundtable discussions. 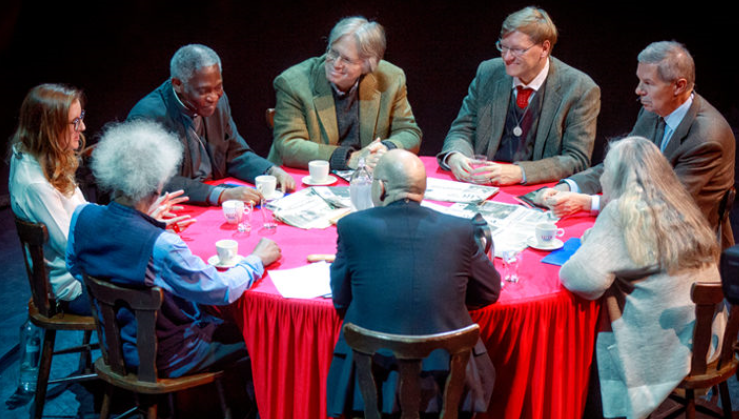 The first round included the acclaimed writer on faith, hope and the meaning of life Marilynne Robinson, Nobel Prize-winning author Wole Soyinka, Cardinal Peter Turkson, A.I.-expert and futurologist Anders Sandberg, classicist Catherine Nixey, top diplomat Jean-Marie Guéhenno and tech investor David Rose. 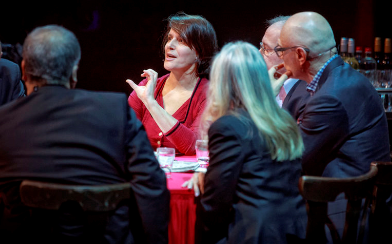 In the second round, the battle continued with the legendary CIA operative and military intelligence leader Michael Vickers, Syrian freedom fighter Kassem Eid, trailblazing transhumanist philosopher Natasha Vita-More, expert on interreligious dialogue Tarek Mitri, New Right-philosopher Catherine Sommerfeld, writer Tatyana Tolstaya and Jewish thinker Leon Wieseltier. Is man. Against death alone he is left with no defence. But painful sickness he can cure by his own skill. Camus’ call to take up the search for the knowledge of good and evil once again was taken up by André Malraux — a philosopher and a writer, but also a diplomat and Minister of Culture during the presidency of his friend, General Charles de Gaulle. Malraux too had fought his battle with fascism, first on the side of the Republicans in the Spanish Civil War and later with the Resistance during the war. He shared Camus’ questions and concerns. In an interview on 5 May 1969, he put it like this: ‘Our civilization will have to discover its fundamental values, or it will disappear.’ But seven years later, half a year before he died, in a speech to the French parliament in May 1976, he could not help but observe cynically: ‘The most powerful civilization humanity has ever seen, our civilization, is capable of destroying the earth, but incapable of educating young people spiritually.’ Hopefully, Malraux will turn out to have been overly pessimistic. But this is only possible if we manage to find an answer to the troublesome questions he and Camus raised. Beyond good and evil: paradise regained? In many ways, Dostoyevsky was no less a prophet than Nietzsche. In two of his most important novels, Demons and The Brothers Karamazov, he predicted the beginning of a new era. As once the God-man Christ ruled the world, so now will the man-god reign supreme: a being beyond good and evil, absolutely free, for whom everything is allowed. With the development of human-like robots and the possibility of achieving transhumanism through astonishing technological developments, we seem indeed to be approaching a post-human era. (*) Utilitarianism is an ethical and philosophical theory that states that the best action is the one that maximizes utility, which is usually defined as that which produces the greatest well-being of the greatest number of people, and in some cases, sentient animals. Jeremy Bentham, the founder of utilitarianism, described utility as the sum of all pleasure that results from an action, minus the suffering of anyone involved in the action. Utilitarianism is a version of consequentialism, which states that the consequences of any action are the only standard of right and wrong. Unlike other forms of consequentialism, such as egoism and altruism, utilitarianism considers the interests of all beings equally. "Listen, O my son, to the precepts of thy master, and incline the ear of thy heart, and cheerfully receive and faithfully execute the admonitions of thy loving Father, that by the toil of obedience thou mayest return to Him from whom by the sloth of disobedience thou hast gone away." "... an epitome of Christianity, a learned and mysterious abridgement of all the doctrines of the Gospel, all the institutions of the Fathers, and all the counsels of perfection."